The Delhi University is a renowned university known to offer a wide array of UG and PG courses to the students. If you have are planning to become a part of any one of the offered UG/PG programs offered by Delhi University, then you will have to clear the DU entrance test with good marks. For some courses, the university considers marks obtained in the higher secondary examination while for others, the university conducts an entrance test. Our coaching institute has prepared many students for the Delhi university entrance test and most of them cleared the examination with flying colours. Depending on the course you apply for, you will have to start your preparations accordingly. We have a pool of highly experienced teachers that have been preparing students for different competitive and entrance examinations for years. Our DU entrance coaching in Delhi near Munirka is sure to leverage your preparation and route it in the right direction. Fine arts, Commerce, and Science are some of the streams whose courses are offered by the Delhi University. 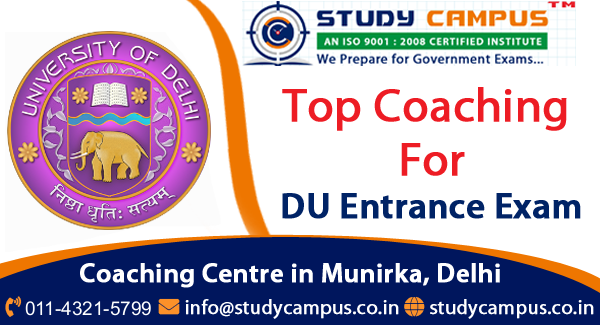 If you want to increase your chances of getting selected, then join the best DU entrance test coaching in Delhi, Munirka for a result-oriented preparation. Owing to our top-notch teaching methods and high student success rate, we receive inquiries for our offered courses from different areas of South Delhi like the Hauz Khas, JNU, Saket, R K Puram, Ber Sarai, Malviya Nagar, Moti Bagh, and many other areas as well. Why Choose Study Campus for DU Admission Test? Each of our offered coaching classes is conducted in small batches that allow the teachers to give equal attention to each student. Moreover, you can consider the following reasons to join us. You can visit our centre to have detailed information about our offered courses. Study Campus Delhi is leading coaching classes for DU Entrance Test. Find the best faculty, low fees, small batches, regular updates and many other facilities in one coaching classes. Top DU Entrance Test Coaching in Delhi, Join for the best result today.